The MAXsys E850 Elite is capable of dynamically correcting for inaccuracies of current transformers (CTs) across the operating range of the meter. A typical metering accuracy CT has an accuracy rating of 0.3% at the full load test point and 0.6% at the light load test point. The MAXsys E850 Elite meter is rated at 0.1% at the lowest rated current. Because of this, the traditional metering CT is always the limiting factor for accuracy in the metering system. The MAXsys E850 Elite can dynamically correct for these CT inaccuracies across the full load curve and offer a much improved metering system. Dynamic CT Correction allows you to improve the accuracy of your existing transformer rated meter installations. It also allows for the improvement of non-metering accuracy CTs (0.6%) where new metering installation points are required. Dynamic IT corrections are a soft-key upgrade feature and can be added to the meter in the field at any time. With peer-to-peer communications, the meters form a network with a single wire loop called a smart-wire (server). Each meter has the ability to post information or take information from the network on a real-time basis. Peer-to-peer eliminates the need to send pulse data between meters (pulse data is non-real time). When meters are able to share real time information at different points, such as generator meters and auxiliary meters, a powerful synergy is created. All of a sudden, netting and summing meter loads before and after transmission and transformer losses is more possible than ever before. Sharing of transformer and line losses among generators in real time based on each generator’s percentage of load is only possible by using the power of the MAXsys real time peer to peer networking solution. Four independent analog output channels per option board are available for any real-time rate function (measured, calculated, totalized or values from other meters over the peer-to-peer network). Up to eight analog outputs are available by adding two analog output option boards to the meter. Output ranges are either -1.0 to +1.0 mA; isolated, active, into 5K-Ohm resistor, or 4 to 20mA; isolated, passive. When the advanced protocol package is soft-key enabled, the MAXsys E850 Elite has the ability to communicate Modbus and DNP 3.0 level 2 protocols through any of the communication ports in the meter. Multiple protocols can be assigned to different ports on the meter and communicate simultaneously. Each port can be configured using Maxcom software without the need to change jumpers and without adding additional hardware to the meter. With the ability to control relays and data Flow using logic and data gate control, application engineers have the ability to meet any special metering requirements. An advanced math package provides the flexibility to develop customized formulas. Best of all, this functionality comes as a standard option on all MAXsys E850 Elite meters. The MAXsys Elite meter is considered to be the industry leader in transformer and transmission line loss calculation solutions. This functionality is a standard option on all MAXsys E850 Elite meters and will allow losses to be calculated across three transformers or transmission lines in series with each other. The MAXsys meters can have up to six sets of values for each of the loss calculations. This allows the meter to change loss calculations as the transmission lines are reconfigured. Using peer to peer communications, the meter can add or subtract loads before calculating the losses, which is ideal for loads between metering CTs and the power transformer. Using peer to peer communications will also allow the summing of multiple load points and then assigning a percentage of the losses to each point based on its percentage of the total load. These calculations happen in real-time one second increments. When the advanced power quality feature is enabled, the meter can perform an event capture of both the voltage and current waveforms. A total of 512 events can be stored in the meter. Captures can be triggered by a PQ event, remotely, an event capture schedule, or by using the navigation buttons on the meter. The user can select the number of pre-event cycles and post-event cycles to capture and the samples per cycle are also selectable from 16-256 samples per cycle in the following steps. The user has the ability to control which events are captured and stored to help reduce the amount of data that is downloaded to a central station. Advanced power quality package enables three independent levels of sag and swell event recorders in the meter. Each sag and swell recorder runs simultaneously within the same meter and setup parameters are independent for each sag and swell recorder with a resolution down to ¼ cycle. Sag and swell events can also be used to trigger captures of Waveforms, RMS and Harmonics events. The meter can also perform a capture of both the voltage and current RMS waveforms. This capture is triggered by an event as defined in the program using Mapper32 and Maxcom. The MAXsys E850 Elite meter is flexible in its configuration and allows the user to select the number of pre-event and post-event cycles to capture. When the advanced power quality feature is enabled, the meter can perform an event capture of both the voltage and current harmonics up to the 126th harmonic. A total of 512 events can be stored in the meter. Captures can be triggered by a PQ event, remotely, an event capture schedule, or by using the navigation buttons on the meter. The user has the ability to control which events are captured and stored to help reduce the amount of data that is downloaded to a central station. 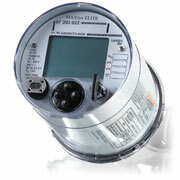 The MAXsys E850 Elite meter supports industry standards for power quality analysis and monitoring. The meter provides flexibility in its configuration to allow the user to only capture and report events under predetermined conditions as selected by the user. The meter also performs much of the analysis within the meter and provides internal counters to report the number of events occurring in specific time increments. This information can be displayed on the screen or formatted into MAXcom software reports. The analysis and reporting reduces the number of events that need to be captured and stored in the meter, and then downloaded from the meter to be post-analyzed with software. Internal analysis tools + flexible event counters = Less data and more useful reports.